Home » Bluehost » Why is Bluehost Managed WordPress Hosting So Expensive? Why is Bluehost Managed WordPress Hosting So Expensive? Update: For the longest time, there was no regular Bluehost WordPress hosting plan on their front page. It was only “managed” WordPress hosting. Now however, they also show normal WordPress hosting just like everyone else. However, these “normal WordPress plans” from Bluehost are just ordinary shared hosting. There’s no separate Bluehost WordPress hosting at a low price point. This review talks about their managed WordPress hosting plan because it’s the only one that’s different from their shared hosting. See for yourself: This is a complete list of bluehost pricing for all their plans. Bluehost WordPress hosting can be pretty expensive. Almost 5 times more so than its competitors! If you’re shopping around for WordPress hosting deals, you might notice an anomaly amongst the popular providers. While most of them have pretty comparable pricing, Bluehost in particular has prices far beyond what the others charge. For example, here’s a quick comparison of the basic WordPress hosting plans between Bluehost, Siteground, and GoDaddy. Bluehost is many times more expensive than its competitors! And this isn’t restricted only to the basic plans. You can also compare the more advanced WordPress hosting plans, and you will find the same phenomenon. Even taking into accounts discounts and coupon codes, Bluehost WordPress hosting still clocks far ahead of the market in terms of price. But why is this? There must be a reason right? In my opinion, there are at least two good reasons for this. The first is capacity, and the second is branding. It stands to reason that Bluehost can’t be charging these high prices for nothing. WordPress hosting is quite a competitive marketplace, and no provider can survive with just overcharging. Indeed, if we look more closely at the plans, the first thing we notice is the number of visitors Bluehost WordPress hosting covers compared to the others. That’s a staggering difference! Literally 1000 times more than Hostgator’s visitor’s quota on the basic plan. And the numbers simply keep getting bigger from there. 300 million visitors for the advanced, 600 million for the premium, and unlimited visitors for the super premium plan. So this meteoric increase in the allowed visitor quota is the single biggest reason why Bluehost WordPress hosting is so much more expensive compared to the competition. It’s truly for “large” sites, that expect millions of hits per month. No wonder then, than despite the discounts, Bluehost charges so much for WordPress hosting. It simply offers a lot more! 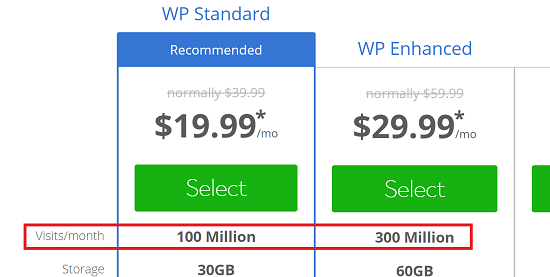 Another reason that allows Bluehost to charge this kind of premium pricing, is that they are officially recommended by WordPress.org as one of the 3 hosting providers. Of course, there isn’t anything inherently special about Bluehost when it comes to WordPress, but just the fact that Automattic is recommending them makes it stand out in people’s minds, and allows them to charge a premium. Another option is to go for Bluehost’s WooCommerce and WordPress package. These are much closer to the shared hosting packages – but still more expensive. This way, you also get a ton of benefits like a private SSL certificate with a dedicated IP. This allows you to make secure payments and get the “green padlock” on your site so that customers trust you with their sensitive data. If regular Bluehost WordPress hosting is too expensive for you even with the promo code, you may want to consider regular shared hosting. The WordPress hosting plan is for large websites as you can see. But if you’re smaller, you don’t need that kind of power. Here’s a standardized price comparison of the major shared hosting plans. Bottom line: Bluehost WordPress hosting is expensive for a reason. The ideal target audience is large websites expecting millions of visitors compared to the other providers whose basic plan visitor count numbers in the tens of thousands. And of course, Bluehost’s WordPress installation is famously simple – but other providers have equally simple setups. If your site requires the kind of firepower necessitated by millions of monthly visits, then Bluehost is the perfect WordPress hosting solution for you.